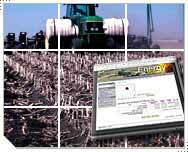 Energy Estimator for Tillage is one of several tools from Natural Resources Conservation Service (NRCS) developed to increase energy awareness in agriculture. The tool estimates diesel fuel use and costs in the production of key crops in your area and compares potential energy savings between conventional tillage and alternative tillage systems. The crops covered are limited to the most prevalent crops in 78 Crop Management Zones (CMZ´s). NRCS agronomists have identified these crops and estimated typical fuel use associated with common tillage systems. Without including every crop and tillage system, the Energy Estimator gives you an idea of the magnitude of diesel fuel savings under different levels of tillage.